During a live broadcast on Wednesday, RT America presenter Liz Wahl announced she was stepping down, citing her disagreements with the network’s editorial policy. Ms. Wahl’s resignation comes on the heels of her colleague, Abby Martin’s recent comments, in which she voiced her disagreement with certain policies of the Russian government and asserted her editorial independence. Aside from the individuals involved, name ONE US/EU propaganda ministry outlet (oops, I mean independent news network), that would not have gone to commercial 3 seconds after the speech varied from the teleprompter. Abby Martin’s speech was being read FROM the teleprompter, indicating producers’ awareness. I don’t believe Ms. Wahl’s comments, given during a newscast, rather than an opinion segment, were read from the prompter. The issue is not their opinion in this conveniently isolated case. The CONTRAST of NETWORKS is the issue. The MORAL VACUITY of American news people and their inter-locking Boards of Directors, ADMITTED infiltrations by CIA, and obedient subservience to Wall Street and daily stock prices. News readers are paid to read the news. PROFESSIONAL PUNDITS claim to be independent, but are paid to regurgitate a PRE-DETERMINED particular point of view, to pretend to qualify for balance or “equal-time|”. NOBODY in MSM aspires to TRUTH, however. Including mercenary “spokespeople”. The only reason MSM is even discussing it, is that it’s RT – RUSSIAN TV. It’s the only reason RT is even acknowledged as a network by MSM, as Ms. Martin astutely points out. Sell your party-line point of view, REPEAT IT as often as possible, and divide the public and the electorate, so that we incessantly argue the parenthetical semantics, instead of the facts, or objectively search for real solutions to serious social and political issues. “Imminent Nuclear War in Ukraine,” a headline might read. “…Kim Kardashian Speaks Out on Crimea”. But first, here’s Jennie, with red carpet controversy at the Oscars. MSM is DESIGNED to divide and conquer. If no controversy…. nobody tunes in, or buys a newspaper. 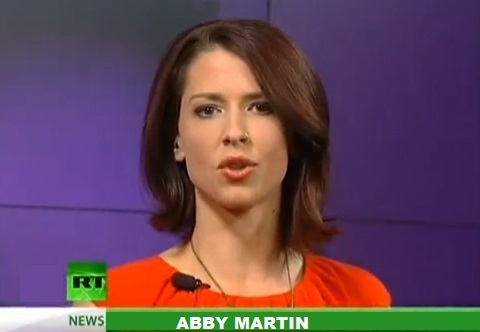 RT, particularly Abby Martin, has always taken an alternative angle to MSM coverage, which serves a purpose in at least a variation from the corporate mantra instructions handed to most “reporters.” However, she is correct in her self-assessment of needing factual information about Ukraine. I have always considered that her historical use of language was obvious in its intent to show the dichotomy between RT coverage and MSM. I have never felt RT was pretending NOT to have a particular slant, whereas MSM is arrogant enough to believe that their script is perennially the Gospel according to Edward R. Murrow. It isn’t. All the more insidious for pretending to be unbiased. The media controversy over these two personalities isn’t about them. It’s about broadcast media itself. “NEWS” IS NOT TRUTH. It’s SELECTIVE PROPAGANDA designed to either convince the masses about a particular agenda or put them to sleep. 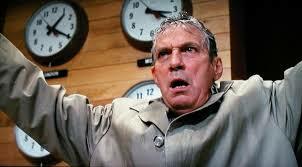 If ANY GOOD comes from it, maybe one of the overpaid self-appointed news arbiters from a major network will have a mea culpa, pull a 2014 version of Howard Beale, and reveal his Employee Instruction Handbook…. perhaps personally autographed by Joseph Goebbels. Meanwhile, Ms. Martin’s subsequent broadcast explained her position more thoroughly, further distinguishing herself, in klieg light contrast to her Mainstream competition, who most likely, no longer even recognize their own smug hypocrisy, as the Republic suffers from their neglect and dereliction of journalistic duty.